Brian and I are planning on camping in the Catskills in two weeks. I found this amazing waterfall that I'd like to climb. 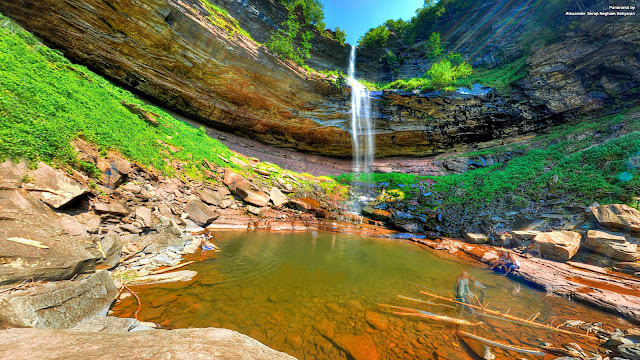 It's Katerskill Falls, dual falls, and has a swimming hole mid-level. I think the saturation has been manipulated in the picture but still, looks like something you'd see in Maui. I'd love to get there. Does anyone have any other great suggestions for activities in the Catskills? The only thing I dislike is hiking over 5 miles. Anything water related I'm totally into. Hi Kathleen! I grew up just across the Hudson River from the Catskills (and I miss them dearly!). Katerskill Falls is definitely a must-see - and yes, this pic must be saturated because I've never seen it THAT colorful, even in the height of summer. :) I recommend hiking around and near North-South Lakes - there used to be an old hotel up there - The Catskill Mountain House - right on the ledge. It's an amazing view and such lovely history in that area. An old railway used to bring people right up the mountain to it! I did a HUGE project on it my sr. year in high school and love, love, LOVE that area, esp. in the fall! (Beware if you're bringing your children, the ledge where the hotel stood is literally THAT - a ledge or cliff. ) Enjoy! Hope it's a fun trip!